BBC news reports that the online Chinese official newspaper has fallen for a spoof by the US satirical website, The Onion. 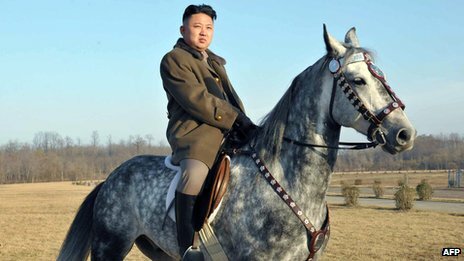 The Onion’s declared North Korean leader Kim Jong-un to be “The Sexiest Man Alive” for 2012 and the People’s Daily ran a 55-page photo spread of him. Here’s a pic of him and his horse (well, probably just one of his probably many horses). Yes it’s a fabulous grey horse. Looks properly fed and healthy too (which is reportedly somewhat more that most North Koreans). But the rider? OK, well-fed. But a wildly attractive man? Also, fellow horsey people, does he look like he has a good seat?